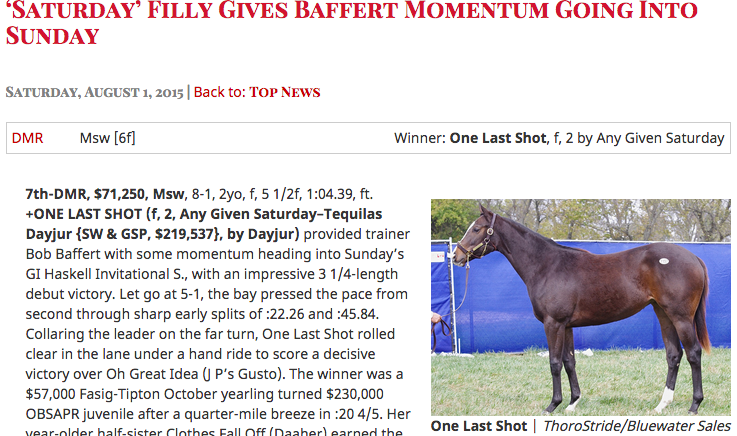 One Last Shot, a two-year-old filly by Any Given Saturday, made an an impressive 3 1/4-length debut victory at Del Mar this weekend. The winner cost $230,000 at the OBSAPR juvenile after a quarter-mile breeze in :20 4/5, and was purchased by Marette Farell for K.C. Weiner and Peter Fluor’s Speedway Stables, who have enjoyed a rare run of success in recent weeks thanks to the exploits of Leigh Court and Grade I winning Hard Not to Like.